“The effective climatic, Edaphic, Topographic and Biotic conditions of a site, which influence the vegetation of the locality”. Climatic Factors (related to aerial environment). Edaphic factors (related to soil condition). · Topographical or physiographic factors refer to the form, behavior and structure of earth surface like: hills, slopes aspects, elevation, valleys and coastal areas. ii. second by modifying edaphic factor through drainage. i. Altitude includes the height of a particular area from the sea level. ii. It tends to produce contrasting local climates. iii. The climatic conditions of summits would be quite different from that of the FOOTHILLS, VALLEYS or FLAT PLAINS. iv. As we ascend a higher altitude, climatic variations become more and more extreme. v. With increasing altitude the wind velocity becomes high, the air and soil temperature tends to get lower and the relative humidity higher. Atmospheric pressure decreases and intensity of heat and high radiation increases. vi. At higher altitude, the vegetation also changes. vii. It affects the vegetation through its effect on temperature and precipitation. viii. It has been observed that after every 400 feet altitude there is roughly fall of 10F in temperature. ix. 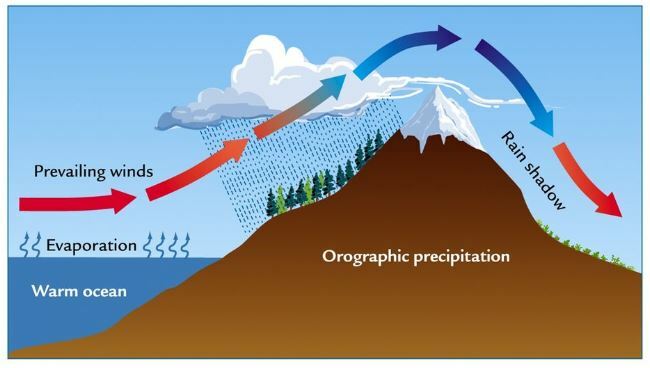 An increase in Altitude is accompanied by an increase in precipitation. i. The height growth diminishes regularly and noticeably with the increase of altitude. ii. The diameter growth is not decreased so rapidly as growth height. iii. Total increment diminishes gradually. iv. The period of development is prolonged. v. In the Himalayas, there is timberline at 1000′ and permanent snow line at 15000 feet. i. Aspect or exposure of mountain towards the sun is an important topographic factor. ii. In the Northern hemisphere, North facing slope tends to be moist than the South facing slopes at similar Altitude. Its influence on Natural vegetation can easily be compared. Vegetation of the North facing slope will e shade bearer and south facing sloe xerophilous species. iii. Owing to the sun’s Afternoon the western slopes of a mountain may be warmer and drier than southern ones. iv. The annual return of litter to the forest floor is less on southern aspect. v. The rate of decomposition of organic debris on southern aspect is faster as compared to that of Northern aspect. Slope influences the distribution of the vegetation by affecting insolation, the stability of the soil, movement of the water as well as the level of water table. § A soil surface which is at right angle to the path of the direct rays from the sun will receive the maximum amount of direct sunlight per unit area. § In the Northern hemisphere steep North facing slope may receive only oblique and weak morning evening rays or perhaps none at all. i. the amount of Runoff, depends upon the angle of the slope. ii. On steep slopes, rainwater tends to Runoff before getting absorbed in the soil. Therefore, sloping surface is usually drier than the horizontal one. iii. On the steep mountain slope, ground water-table is deep, plants cannot reach the permanent source of water supply. iv. Water-table is high in the valley, therefore luxuriant vegetation is observed. v. In the region of high rainfall, slopes suffer from active erosion this swift running of water carry away the humus and soil from the slopes. Therefore in such localities plants cannot establish themselves. § There is always a tendency in water movements to remove soil from slope and carry it down and deposit in the valleys. § The gentle slope retains more water then the steep slope. i. Direction of the mountain range, play a key role in the local climate of a region. they prove a hindrance on their paths thus causing heavy rains on the windward side of the mountains, bringing about drastic changes in the climate of the region as well as luxuriant vegetation at the foothills. e.g. (a) In Sind KIRTHAR range is parallel to the prevailing winds, as a result, they cannot stop the moving monsoon clouds. Thus Baluchistan and Sindh provinces remain dry for the most part of the year. (c) Conversely Hindukush range of Himalayas are opposite to the monsoon winds, therefore, they stop the oncoming clouds and bring about heavy rains at their foothills. (d) The position of mountains also responsible for low rainfall in the inner Himalayan valleys e.g. Gilgit and Hunza. The soil is fertile in valleys and moisture supply is sufficient then on ridges and their vegetation are different than that of the mountains. To read other Climatic Factors, please use the search option.